Agustin Hunneus and his family have given the American and indeed the world wine industry a true legacy of great business operations and great winemaking. He is the mastermind behind the founding of many great brands in the US including, Franciscan Estates and Winery, in the Napa Valley and Estancia in Monterrey. Most recently after successfully bringing the luxury brand The Prisoner to prominence, he and his son sold it Constellation brands for nearly 300 million dollars. This article and interview written by Ted Reiger of Wines and Vines (March 10, 2017) is a must read. Davis, Calif.—Agustin Huneeus, and his son, Agustin Francisco Huneeus, have worked together successfully, first with Franciscan Estates and today with Huneeus Vintners, and have an impressive history of building, buying and selling wineries and wine brands. Their family businesses have succeeded through long-term planning, strategic investments, capitalizing on market trends, and adapting to change. 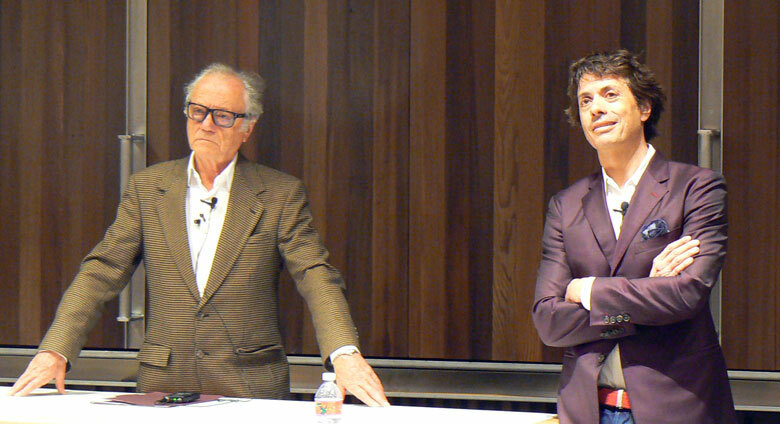 The two men were honorary lecturers at the University of California, Davis, March 8 for the Walt Klenz Lectureship Series, sponsored by Treasury Wine Estates and named in honor of former Beringer Blass CEO Walt Klenz. Begun in 2006, the lecture series is presented by the Robert Mondavi Institute and the Department of Viticulture and Enology to feature wine business leaders who share insights and experiences with students, faculty and industry attendees. Agustin Huneeus began his wine business career at age 24 in his home town Santiago, Chile, with Concha Y Toro. After 12 years, the company grew to become the largest winery in Chile, in large part, through its wine exporting business. In 1971, he moved to New York to head Seagram’s worldwide operations that included then-popular Paul Masson wines and 14 other brands. He left Seagram’s in 1977 and moved to California where he founded Noble Vineyard in the San Joaquin Valley, and later acquired Concannon Vineyard in Livermore. In 1985, he became partner/acting president with Napa Valley-based Franciscan Estates that grew to include Estancia Estates, Mount Veeder Winery, and Chile’s Veramonte Winery. Franciscan was sold to Constellation Brands in 1999. He later created Huneeus Vintners developing its flagship Quintessa Winery property in Napa Valley, and added brands to the portfolio that now include Flowers, Faust and Illumination. Augustin Francisco Huneeus grew up in the wine business and started his career in 1989. After graduating from the University of California, Berkeley, he moved to Chile for his first job in the wine industry. He returned to California to become general manager at Estancia Estates. He later joined his father as head of sales for Franciscan Estates. After Franciscan was sold to Constellation in 1999, he remained as manager of Constellation’s fine wine portfolio, during which time the company acquired several notable California wineries, including Ravenswood. He left Constellation in 2004 to join Huneeus Vintners. The two men said they don’t agree on everything, but bring different strengths and perspectives to the partnership that blends the father’s experience in production and management with the son’s focus on marketing and sales. “My father left me a company with a great balance sheet. We were able to buy Flowers Vineyard and Winery at a time when other companies couldn’t,” Augustin Francisco Huneeus said. The Huneeuses later sold The Prisoner Wine Company to Constellation in April 2016 for $285 million. During their lecture, the two took turns exchanging ideas and opinions on several business concepts and wine industry trends. Some of their comments are summarized below. Agustin Huneeus (AH): Sow your feet firmly on the ground, but keep your nose seeking new aromas that are coming. Whatever is today will not be tomorrow. What do you see and anticipate coming that will make you successful? You have to plan for new aromas in the vineyard, and this requires long-term planning and investment. Augustin Francisco Huneeus (AFH): I agree with that. In Burgundy, either you’re born into a Grand Cru vineyard or you’re screwed. There is no opportunity there for entrepreneurism. In California and New World regions, this business changes and there is an opportunity for entrepreneurs with new ideas, and for people who can take advantage of changes in consumer and market trends. Merlot was the craze when I was with Franciscan from 1995 to 2000. Clos du Bois Merlot was the hot wine to order in restaurants at one time, but try to find it today. AH: Wine is a people business, that’s a cliché, but it’s true. People look for and want to know the person behind the brand. When we talk to a restaurateur, a retailer or a consumer, we are promoting our personality. AFH: It’s definitely a people business. But when brands become highly successful, they transcend their owners, they end up becoming something different from what they started as. Brands that resonate with consumers can reach a point of recognition and perceived value where they outgrow the cliché. AH: Terroir and appellation are Old World, traditional concepts that indicate wine quality. Varietal is a New World concept for identifying and marketing wine. A varietal label will not identify what’s in the bottle. Where it’s from will more accurately define it and its quality. AFH: Fine wines are all well made today. I don’t see a feasible way to market wines based mainly on appellation, there are so many of them now, and consumers don’t know where most regions are, or what their characteristics are. It worked for places like Bordeaux and Burgundy, but for most wines it doesn’t work well in today’s market for today’s consumer. AH: Wine ratings and critics’ scores are an American invention. There is a completely different concept of quality in traditional European wine regions where the best wines are those that conform to a certain typicity and style. When you see a numerical rating, you tend to think this corresponds to the pleasure I will get from this wine. No, it’s the pleasure someone else got from this wine. While ratings have had positive benefits in bringing attention to wine, they also have the effect of moving wines toward being the same. AFH: Today there are so many 90 point scores from so many raters, that ratings mean less and less, and I think their importance is going away. New generations of wine drinkers won’t care about a Robert Parker rating. It will continue to change toward people recommending wines to people, not kings recommending wines to the masses. AH: We talk about Napa Valley Cabernet Sauvignon as our highest quality fine wine. But you can take a Washington state Cabernet grown in a vineyard valued at $3,000 an acre and blind taste it with a Napa Cabernet grown in a vineyard valued at $350,000 an acre and find both to be of high quality. Quality myths are also promoted and perceived based on packaging and closures. AFH: Wines bottled with corks are considered higher quality wines. I know high quality fine wines can just as easily be finished with screw caps. But people want to buy fine wines in cork finished bottles, so I’ll give them wines in cork finished bottles. There are “rules” in the industry that aren’t substantiated by facts and science. But if you start to destroy all of those myths, the wine business starts to crumble, you can lose the images of places like Napa and Burgundy. I think you have to respect some of the foundational myths about the wine business that make it special. It’s a fine line. Leave the important foundations, and start to change the myths that have less importance and don’t have good reasons to back them up.